Arkansas’ contribution to the nation’s gross domestic product expanded at an annual rate of 3.5% in the second quarter of 2017, outpacing the U.S. average of 2.8% and ranking as the 15th highest growth rate among the 50 states. 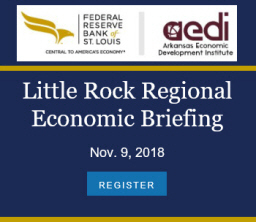 * This morning’s report from the Bureau of Economic Analysis also revised estimates for Arkansas GDP growth in the previous two quarters. Originally reported as 1.3%, the (annualized) growth rate in the first quarter of 2017 was revised upward to 4.0%. For 2006:Q4 the figure was revised from 0.5% to 4.8%! 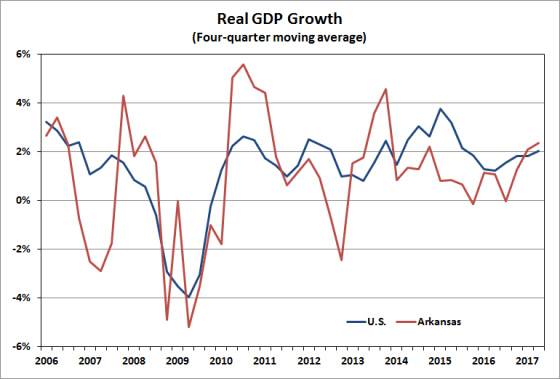 For the period 2016Q2-2017:Q2, Arkansas GDP growth is now estimated to have grown by 2.4% – slightly higher than the national average of 2.0%. Revisions to previously published data went back to 2014:Q4. The figure below illustrates the effect of these revisions for Arkansas. Although the level of economic activity was revised upward for most of the period, the cumulative effect on growth from 2014:Q1 through 2016:Q3 was essentially nil. But the substantial revisions to the next two quarters had the cumulative effect of increasing GDP estimates by 1.8%, with the new data for the second quarter adding another 0.9% (not annualized). 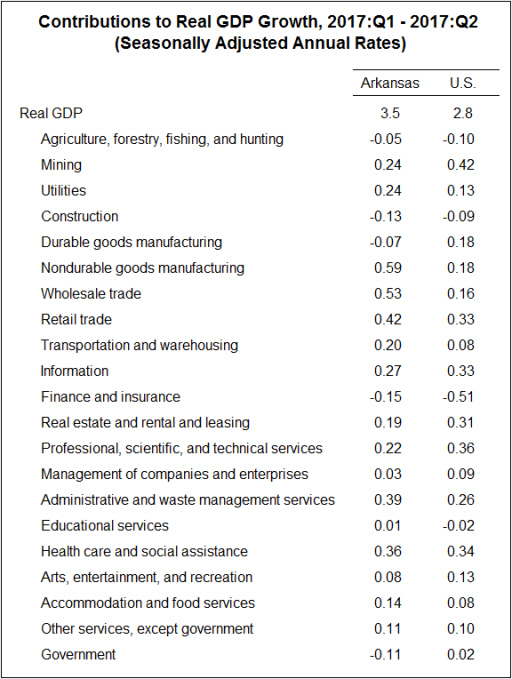 Breaking down the data by sector, the composition of growth in the second quarter was similar for Arkansas and the U.S.* Sectors contributing to the higher growth rate in Arkansas included nondurable goods manufacturing and wholesale trade. Those two sectors were also the largest contributors to the overall growth rate in Arkansas, together accounting for more than a full percentage point. 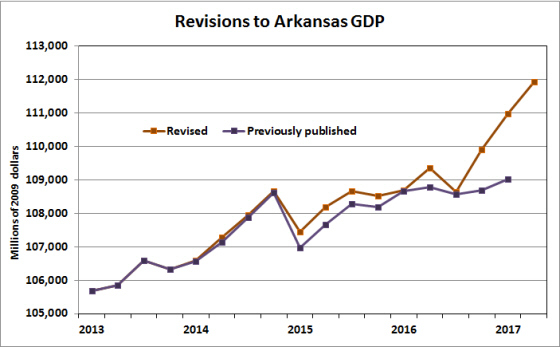 These new readings on Arkansas GDP growth, while subject to future revision, provide an auspicious view of recent developments in the Arkansas economy. To find out how this affects the outlook for 2018 and beyond, be sure to attend my presentation of the Arkansas forecast on December 1! *Data for U.S. values used in this report differ from the national income and product accounts because the state accounts exclude federal military and civilian activity located overseas that cannot be attributed to a particular state. Thank you to all who attended this morning’s Regional Economic Briefing, where I presented my annual forecast for the Arkansas economy. 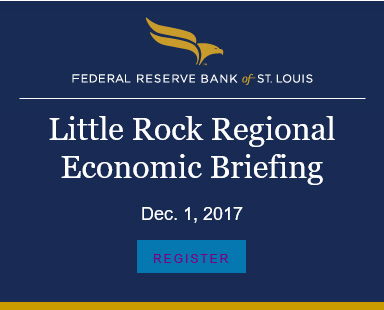 Special thanks to the Little Rock Branch of the Federal Reserve Bank of St. Louis for co-sponsoring the event, and to our guest presenter, Chris Varvares. Links to the presentations can be found by clicking the banner above.